Lynn Nottage's Sweat is tailored for the current juncture in American political life. This dark, often humorous drama concerns eight Rust Belt factory workers grappling with effects of industrial mechanization and the transfer of blue-collar jobs to other countries, especially Mexico, where operating costs are well below those in the United States. 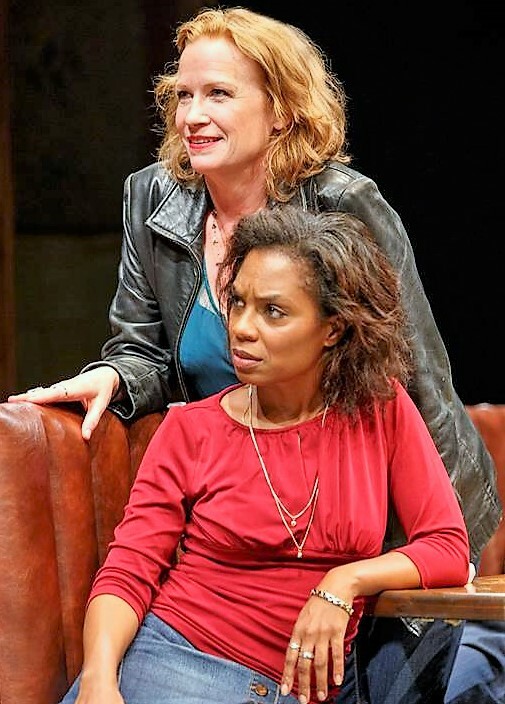 Johanna Day (top) and Michelle Wilson star in Lynn Nottage's Sweat. Top, from left: Day and Wilson with Miriam Shor. During the recent presidential campaign, candidate Donald J. Trump spoke repeatedly about the dilemma of Carrier Corporation employees in Indianapolis losing their jobs as their plant is relocated to Monterrey, Mexico. The shutdown of that Indiana facility, which manufactures heating and cooling equipment, is expected to eliminate 1,400 jobs over the next two years. While campaigning, the President-elect cited the Carrier workers again and again as typical of blue-collar Americans the Trump administration will help; and reportedly many of those workers are counting on that promise to shield them from economic catastrophe. Since the characters of Nottage's drama face the same dilemma as Carrier's Indianapolis labor force, the New York debut of Sweat is well-timed. But it wouldn't be fair to characterize the play as a by-product of the recent election. Commissioned by the Oregon Shakespeare Festival and Arena Stage in Washington, D.C., this complex, beautifully written drama premiered more than a year ago in Ashland, Ore. And its themes transcend the present moment in the way that Clifford Odets' plays from the Great Depression—Awake and Sing and Golden Boy, for instance—transcend the 1930s. In Sweat, management at the Olstead Company (a fictional manufacturer of steel tubing in Reading, Pa.) aims to reduce its costs by renegotiating collective-bargaining agreements. When that plan meets widespread resistance from the factory floor and among union leaders, the company locks out recalcitrant workers and, later, moves the Reading plant’s functions to Mexico. Sweat opens with a prologue that takes place eight years later than the principal action of the play. This means that the audience knows, from the beginning, that the ending's going to be sad. But Nottage, who has demonstrated a gift for gripping narrative in plays such as Ruined (which won the Pulitzer Prize for Drama in 2009) and Intimate Apparel (2004 New York Drama Critics Circle Award), cultivates acute suspense and an accelerating sense of foreboding that guarantee rapt attention in the audience through the final moments of the play. Sweat James Colby is Stan and Khris Davis is Chris in Sweat. In Tracey’s view, Olstead is a safe haven for light-skinned people of European descent. “Olstead’s isn’t for you,” she tells Oscar (Carlo Alban), an American-born youth from Reading's Hispanic community, when he inquires about jobs there. Tracey may be right about how the company used to operate, but she's in for a series of surprises about the present. She’s taken aback, for instance, when Cynthia (Michelle Wilson), who’s African-American, gets the promotion for which the two have been competing and leaves the factory floor for a low-level position in management. With dialogue that’s always believable and monologues that bore into the consciousness and unconscious of her characters, Nottage depicts the effect of uncomfortable change on group dynamics. The playwright’s gift for dialogue and characterization are so assured and accurate that the spectator is likely to overlook the periodic grinding of the play’s expository machinery. Sweat focuses on four friends (played by Day, Wilson, Miriam Shor, and John Earl Jelks) who have grown up together, worked in proximity, and socialized regularly at the bar (a classic Rust Belt dive) in which most of the play’s scenes are set. Now they have been joined by a succeeding generation on the Olstead payroll, represented by Tracey and Cynthia’s sons (Khris Davis and Will Pullen). Davis with John Earl Jelks (left) as his father Brucie. Working with a well-matched ensemble of actors, director Kate Whoriskey treats the play’s 15 scenes like movements in a musical suite, conducting each at a distinct and distinctly appropriate tempo. The climax, as choreographed by fight director U. Jonathan Toppo, combines the verisimilitude of news footage with the pity and awe of Greek tragedy. The scenic designs by the incomparable John Lee Beatty and arresting projections by John Sugg give Sweat the gritty look and feel of an early Barbara Koppel documentary. That aesthetic approach is especially appropriate for this work by a dramatist known for making research—especially interviews—the starting point for her plays. Nottage’s interviews with citizens of economically bereft Reading, Pa., are an essential source of this powerful drama; but the author's remarkable dramatic imagination enlivens and lends emotional depth to the data she has collected. On its surface, Sweat is a group portrait of citizens beleaguered by indignity, disillusionment, and loss of control. Like all the best naturalistic drama, it’s also an exhaustive journey through the tortuous byways of the human heart. Lynn Nottage’s Sweat has moved to Broadway. This review is based on the production at the Public Theater (425 Lafayette St.) that closed Dec. 18.